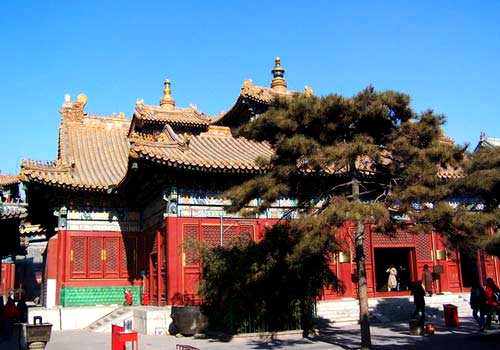 Built in 1694, the Lama Temple is located in the northeast of Beijing. It was built as a mansion by Kangxi, the second emperor of Qing Dynasty (1636-1911), for his son Yongzheng who is the third emperor. 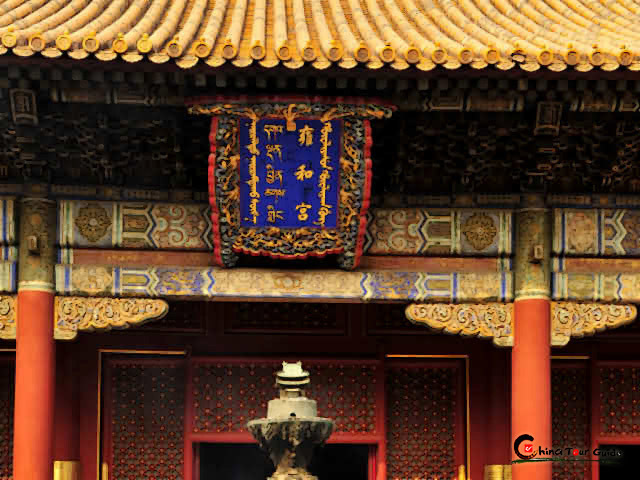 With yellow tiles and red walls, the Lama Temple has the same standard with Forbidden City. The mansion turned into a temple of Buddhism in 1744. The Lama Temple is reputed as the Buddhist temple of the highest standard in China. 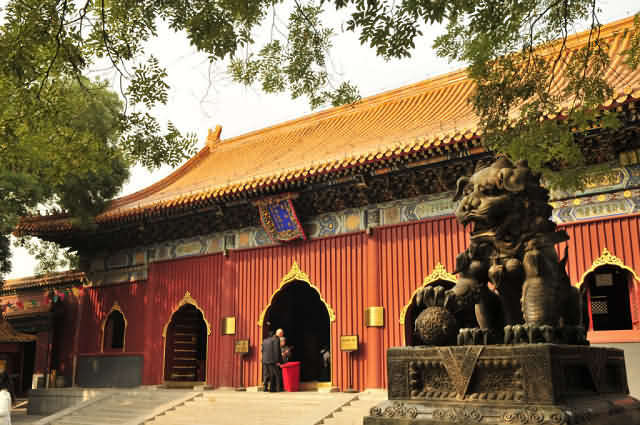 Lama Temple is formed by the archway, the Heavenly Guardian Hall, the Hall of Mahavira, the Hall of Eternal Blessing, the Hall of Dharma Wheel and Wanfu Hall with compound halls in the east and west. As the courtyard of the temple becomes smaller from south to north, the hall becomes taller which represent the features of ethical architectures. Besides the layout of the temple and the majestic decorations of the halls, the unique Buddhist relics in the temple are also worth to see. 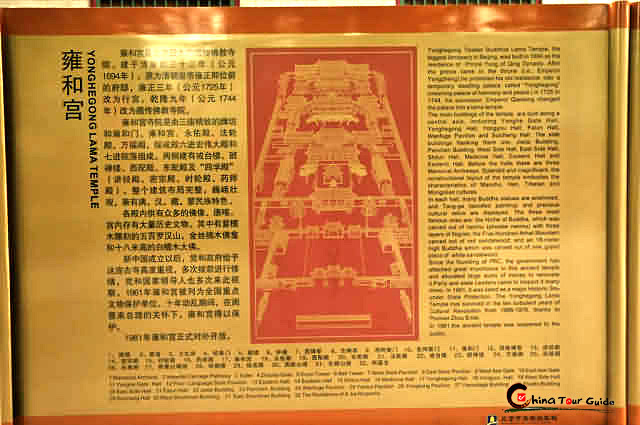 Lama Temple is regarded as the Buddhist Museum. Dalai and Panchen Lama who are the two living Buddha in Tibet once propagandized in the temple. 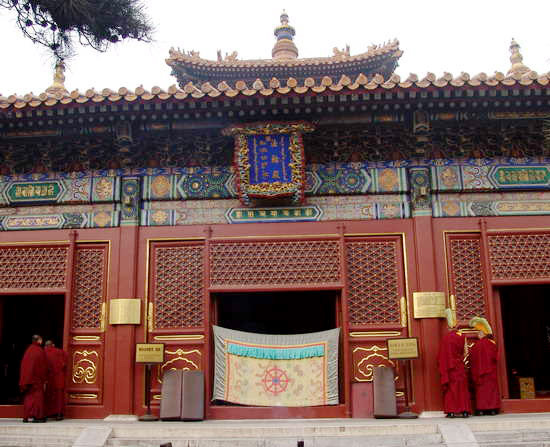 As a religion stage, Lama Temple has its significant position in the aspects of religion, culture and national unity. It is a cultural relic in value of history, art and science. With an area of 660,000�O, Lame Temple is divided into three parts, the east part, the middle part and the west part. 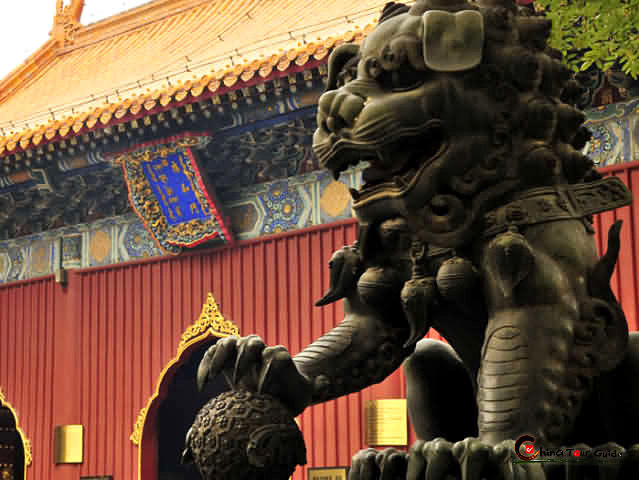 Three steles and a pair of stone lions are sitting in the south courtyard of Lama Temple. Walking through the Zhaotai gate, you will find the Drum tower on your left side and the Bell tower on the right. 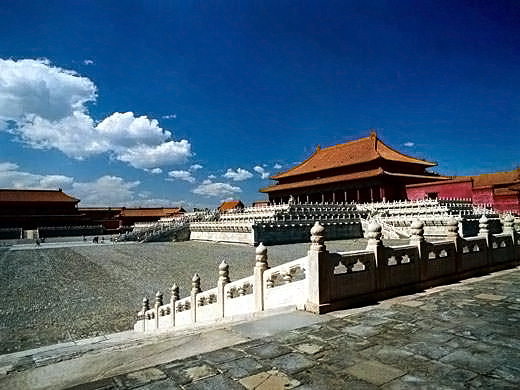 Going towards north, two octagon pavilions can be found at two sides with the Heavenly Guardian Hall in the middle. The main hall of the temple, the Hall of Mahavira comes after the Heavenly Guardian Hall with the Hall of Eternal Blessing behind. 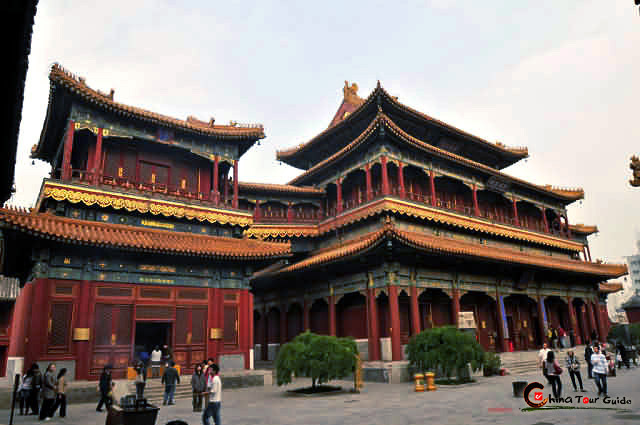 After crossing the Hall of Eternal Blessing, the Hall of Dharma Wheel which is the largest hall of Lama Temple, comes into sight; Wanfu Hall is just behind the Hall of Dharma Wheel. The Heavenly Guardian Hall is in the middle of two octagon pavilions. The figure of Buddha Maitreya sits in the middle of the hall with the 4 Guardian kings of the Directions on the two sides. Behind Buddha Maitreya, it is the figure of Weituo Bodhisattva. Weituo, who is a general of the direction god, is famous f Four Direction Gods or his braveness and speed. 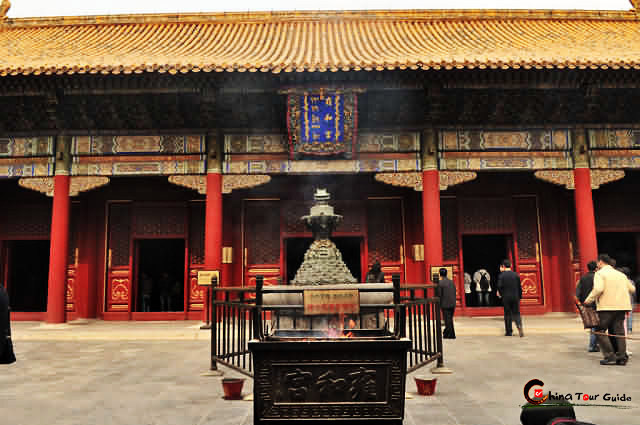 The Hall of Mahavira is the main hall of Lama Temple. Named as the Hall of Silvery Peace, the hall was used as a place for Yongzheng to meet official before. In the north of the hall, there sits three figures of Buddha. The Sakyamuni Buddha is in the middle which represents nowadays with Burning Lamp Buddha representing the past on the left and Maitreya Buddha on the right representing the future. The figure of Kwan-yin Bodhisattva is situated at the northeast corner of the hall. Eighteen disciples of Buddha can be found at the two sides of the hall. 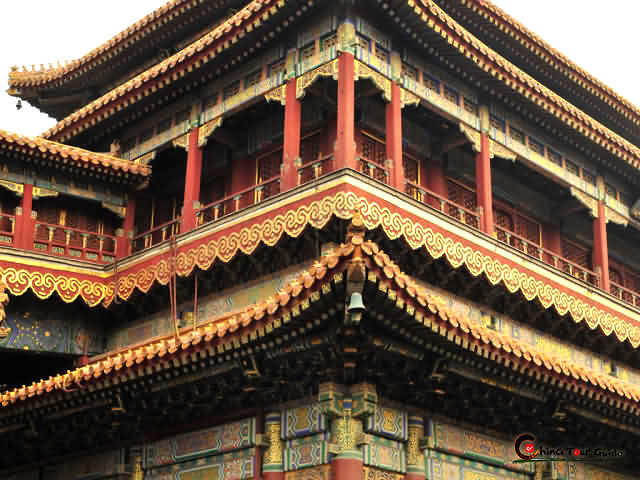 As the largest hall of Lama Temple, the Hall of Dharma Wheel is in the shape of crisscross with five blindstories on its roof in the style of traditional Tibetan architectures. The Hall of Dharma Wheel is the crystal of the blend culture of Tibet and Han. In the middle of the hall, the bronze figure of Tsong-kha-pa in a height of 6.1 meters (20 ft) is sitting on the Lotus platform. Tsong-kha-pa is the founder of Buddhism Sermon (Tibetan Buddhism). It took 2 years' time to finish the construction of the figure. 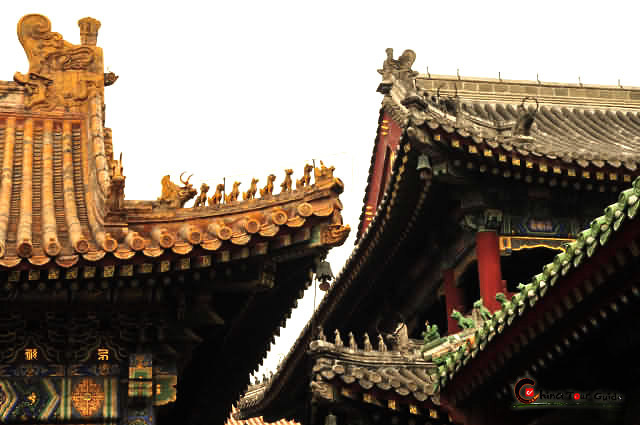 The three great woodcarvings in Lama Temple are 500 Arhat Hill, sandal wood Buddha and Briar Wood Buddhist Grotto. 500 Arhat Hill is in the Hall of Dharma Wheel. 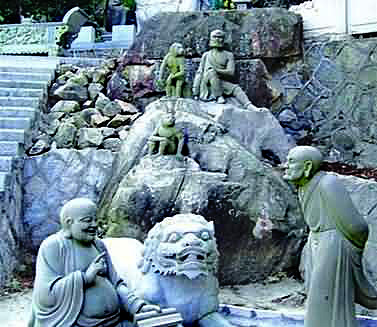 The whole hill is carved in Pterocarpus santalinus with 500 figures of Arhats casted by gold, silver, bronze, iron and tin. The 500 arhats are in different manners and gestures. Now, only 449 of the 500 arhats are preserved after the wars. The sandal wood Buddha is in Wanfu Hall. With a height of 26 meters (85.28 ft) (8 meters underground) and the diameter of 8 meters (26.24 ft), the Buddha is carved from a sandal tree. 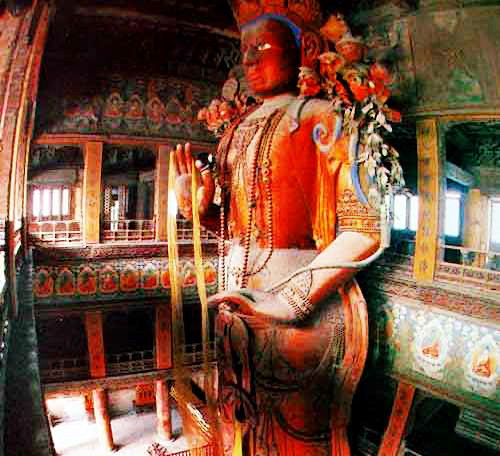 It is the largest Sandal wood figure in China. The Briar Wood Buddhist Grotto is in the east of Wanfu Hall. 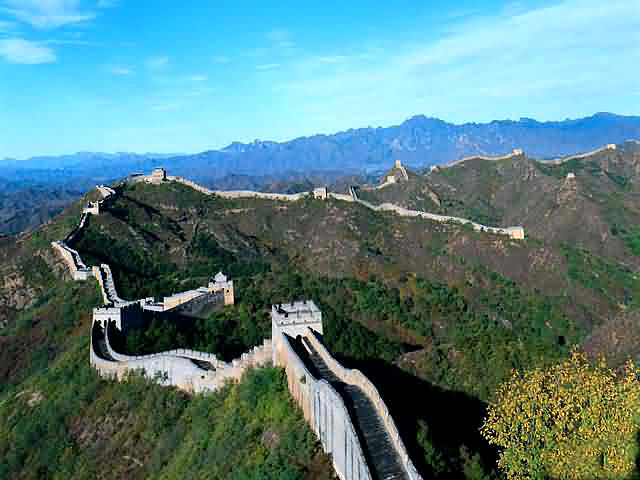 It extends from the gound to the roof of the two-story floor in a length of more than 10 meters (32.8 ft).